College can be pretty rough. The exams, the four to five classes a semester, and the commute can really eat up a good portion of your month, leaving you with very little free time. And to make matters worse, you may need money to survive or pay a few bills while living at home. Regardless of your circumstances, you need to know that there are so many ways to make money in your free time, most of which don’t even require a set schedule. In fact, most of the opportunities I’m about to list can work for anyone, not just college students. You don’t need a college degree to start. 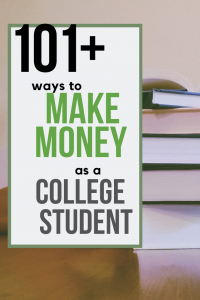 So, if you’re looking for a way to make money as a college student, this HUGE list, which is over 10,000 words long, should give you at least one idea to start making money as early as today. One of the easiest ways to make money RIGHT NOW is in the research world, wherein you can help take surveys with reputable research companies. And the best part about this? And to explain how it works, it’s quite simple. Sign up for one of the many survey companies online (check out my 80+ favorites), create a profile and then start answering the surveys as they come in. Sign up for all of them if you wish as there is no limit. Just make sure you’re honest with your profile when signing up. Now, you won’t always qualify for a survey, but even if you don’t, a lot of the reputable companies will still credit you anyways, not wasting your time. Don’t expect to get rich in doing so, but if you sign into your favorites and attempt to answer a few surveys a day, there’s no reason you can’t make $200+ a month or even more if you’re aggressive. All of these websites are 100% free, and in some cases, these websites do offer sign-up bonuses just for confirming your e-mail. And aside from surveys, some of these websites, such as Swagbucks and Inbox Dollars, offer a variety of other ways to earn, including playing games, searching the web, checking your email and much more. I can’t stress it enough. The list above is one of the many companies I recommend, so be sure to check out the others to see if they are of interest. One of the most popular ways to start earning money right now is via the very popular Amazon mTurk program. And to explain it in depth, I would need to write a new post in detail, but for now, I’ll give you a quick summary. Basically, on Amazon mTurk, you will perform short tasks for thousands of providers, most of which pay anywhere from $0.01 to $1+ each. Yes, you get to choose what you want to work on and can even preview the work before committing. I know, it doesn’t sound like much, but a lot of these tasks only take a few seconds to do. Whether it’s researching a phone number or analyzing a photo, there are always a TON of things to do, and most of it is extremely easy. Just follow the directions and your work should be accepted. Now, you’re not going to get rich doing, but people do make $300, $500 and even $1,000 a month working a few hours a day. For example, I have dabbled with mTurk and averaged about $200~ a month when I did do it, but I don’t do it as much anymore. For now, I do recommend a few of these low-cost eBooks on Amazon that can explain the system in detail as well as this forum and subreddit. Do you feel you’re an expert on a particular subject matter? If so, you may want to consider checking out JustAnswer.com, one of the Internet’s largest websites that connect you with experts to answer your question. Now, you don’t necessarily need a degree to participate, but in some cases, you may need a certificate of sorts to qualify. It greatly varies on which topic you want to work with. For more information, visit JustAnswer.com to see if you can qualify to start making money by answering questions. It’s a great way to make at least $5 to $10+ per question answered. From paintings to sculptures, there are a variety of awesome platforms online that enable you to post your artwork for a price and see if anyone is willing to pay the price. While there is a lot of competition and it could take some time to start seeing money come in, it could be a great opportunity for those who have a love for art. Why not get paid for your hobby? As always, all of these websites will work differently in terms to restrictions as well as fees when you sell, so make sure you always read the FAQ to know what you’re getting yourself into. Quite possibly the fastest way to make money right now, babysitting is quite lucrative for college students, and the best part is that it doesn’t require a TON of work. Whether it’s watching children during the day while the parents are at work to a Saturday date night, the opportunities are endless, but in the end, you get to choose your own hours as well as who you want to work with. And even if you don’t know of anyone who needs a babysitter, there are some great resources you can use right now to start finding work ASAP in your areas such as Care.com and SitterCity. Chances are there’s a bar near your college campus, and as long as you’re 21+ years old, these bars may be looking for help. Now, as a bartender, you will have to work later hours, but the money can be almost as good as your future corporate gig, with some bartenders easily raking in $300+ a night. Bartending certification is recommended; however, it isn’t required as many bars will be more than happy to work with you if they think you have potential. Search Indeed.com, visit a local bar or even ask a friend if they know of any bars hiring in your college area. You probably have seen this option recommended a million times over if you have been researching this topic for quite some time, but honestly, it’s one of the best ways to make a decent amount of money. For instance, take a look at the website you’re on right now. It’s run by myself mainly, and while I’m just starting out, I have had projects in the past that have sold for quite the sum. So much so, it’s allowed me the freedom to almost retire early. Now, starting a blog is easier said than done as, like most things, it will take a lot of work. And while this can be its own post in itself, for now, I recommend you check out these top selling books on Amazon, low-cost guides on Udemy or just search Google for some decent results to get started. I promise you that I will create a course eventually, but for now, try to absorb as much information as you can and start to take action to at least learn the industry. In short, your goal is to create captivating content people are searching for and optimize your content, in a non-spammy way, to make you money and rank on search engines as well. As a fair warning, however, you will run into A LOT of bloggers who want to charge you $100, $200, or $300+ for their courses, and while it is tempting to sign up, the Amazon books and low-cost Udemy courses, which retail for less than $15 most of the time, can do just as good of a job to get you started, I promise you 110%. I could babble quite a bit about this topic, but for now, if you want a passive income that pays off huge dividends in the future, keep blogging on your radar. As long as you’re not afraid of needles, donating blood plasma is a fantastic way to make money and help people in the process of doing so. A pinch different than donating blood in a scientific sense, the red blood cells and platelets are returned to the donor if you wanted to know, but regardless, it involves a needle and blood. Most donors can make about $20 to $50 per visit or about $200~ a month, but this will depend on your location and how often you visit. To find a local plasma center, usually a simple search such as “plasma donation + your zip code” can yield some good results. No, I’m not talking about a local call center where you would work 40 hours a week and have to sit in a cubicle. Instead, I’m talking about a virtual call center, wherein you will take the calls from the comfort of your own home using a headset and your computer. Now, like a call center, you will need to commit to a schedule in most cases and it may not be as flexible, but it’s a nice option if you don’t mind talking on the phone and sitting at a desk for up to eight hours a day talking with people. 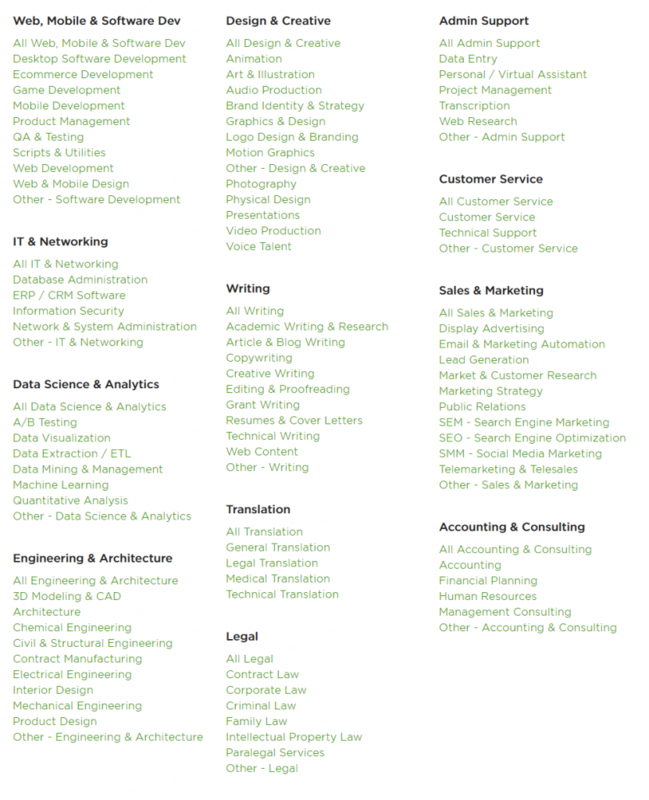 In the virtual call center world, there are a lot of options, some of which I list below, but there are many more. I will write about this more in the future as there are a TON of companies to work for, but for now, the major companies mentioned below should be enough to get you started. Aside from this list, I also encourage you to check out Indeed and search for terms such as “at home call center” or “virtual call center,” as you may find smaller companies that need help as well. This is a unique one I found online and figured I would add it here as a great option if you like the idea of writing in calligraphy. From selling handwritten invitations or stationary on Etsy to offering your services on Fiverr, there could be a market for you if you’re considered good enough. And if you want to learn the art, there are so many awesome learning kits on Amazon as well as how-to videos on Udemy. Almost all of your universities have massive dining halls, and yes, most of these restaurants need help, most of which is ran by current students. From preparing food to cleaning the cafeteria, this can be a great opportunity if you live on campus or even nearby. While the hours can be just the fast food world, you will need to fill out an application just as you would at a local fast food joint and sit through an interview. If you already visited some colleges in the past, then there’s a pretty good chance you went on a tour with a current study. As a tour guide, you get to talk about the university you’re attending, show prospective students the grounds and answer any questions a student may have. To become one, check with your local college career office for more information. Much like a regular job, you will have to submit a resume, attend an interview and go through training if hired. Depending on the size of your campus, there are often a variety of jobs available, aside from the dining and tour options mentioned above. And if you don’t mind working on campus and working a set amount of hours, I recommend you go to your college’s official website and look for the job board to see what opportunities are available. 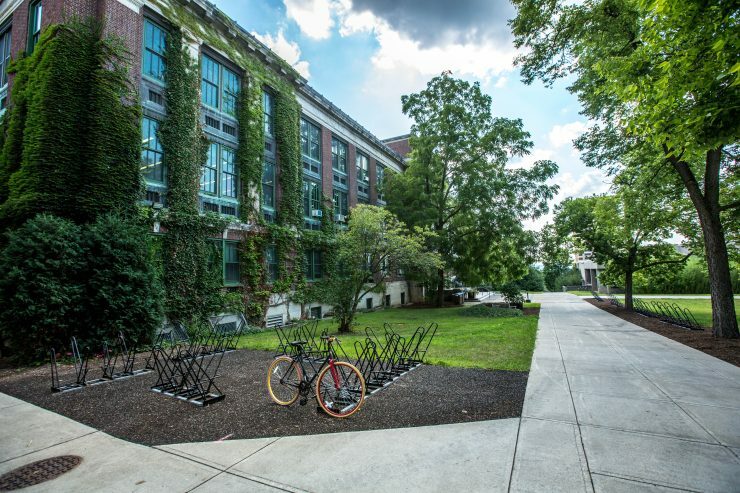 In most cases, you will have to work a set schedule and usually undergo some sort of training, but if you want to work on campus and not have to worry about hustling, then I don’t think it could get much better than this. Catering companies often are in desperate need of servers, usually on weekend nights, and often hire college students on a call-in basis, making for a great flexible gig. If you don’t mind serving food and have the experience, then you could have a good chance at landing the gig. To find one, I recommend you check out your local Craigslist “Gigs” section to see if any catering companies are hiring. You can also contact major catering companies in your area as well to see if they are hiring. There may be a chance you have heard of the popular scooter companies, Bird and Lime. And in short, these companies leave scooters scattered around the town, where anyone can use their phone and activate one to take around town, paying by the minute. Now, since these scooters run on a battery, they do eventually die, but this is where you can come in and help charge them inside your home while using an app to find them. Once you charge them, the app will then tell you where you need to return them. The company does offer chargers, but it’s up to you to provide the electricity so be sure to factor this into your expenses. It’s not much from what I read, however. Like Uber, you can work whenever you want and choose the scooters you want to charge, truly making it a flexible gig. If it sounds interesting, visit Bird.co or Li.me for more information as to how to apply. Being in college, there’s a good chance you took some notes for your past classes, right? I don’t have any experience with these options, but it appears you can earn about $25 to $50 per credit hour for each class you’re approved for. Even if you’re just starting out in college, be sure to save them as they can come in handy as you can see. Have a knack for crafts? Whether it’s creating a scarf, a handmade wood sign or even a personalized greeting card, there could be a market on popular crafting websites such as Etsy. The money won’t come rolling in right away, but with the right promotion skills, it could take off if what you’re making is considered in demand and of quality. I haven’t dabbled much in the crafting world, but I did see quite a few highly rated courses on Udemy for a few dollars as well as some highly rated books on Amazon, such as Etsy-preneurship and Starting an Etsy Business For Dummies. Cleaning houses don’t take much in terms of startup costs, and the great thing is that you can make up to $300+ a day if you’re cleaning some of the bigger homes in your area. And while this can be a pretty competitive field, the word can spread fast if you do a great job and show up on time. Plus, it’s recurring money as many homeowners want their homes cleaned weekly. From creating a profile on Care.com to posting an ad on Craigslist, I can almost assure you there are a TON of people in your area who are in need or even thinking about hiring a professional. While I haven’t cleaned homes professionally, I found some very highly rated, low-cost books on Amazon as well as a very highly rated course on Udemy teaching you how to successfully start your own cleaning business. Cleaning can be a lot of work, but it can pay off if you find the right clients. Clinical trials can pay some decent money if you don’t mind helping the medical community, such as answering questions, testing a drug or even undergoing a medical exam if you had a certain condition. Now, while some may consider this risky, and I do agree, there are some studies which involve no medicine, for instance, so it doesn’t hurt to look for fun. These studies could range anywhere from a simple questionnaire about your health to learning about the effects of a certain medicine over the next few months. It greatly depends on the study you participate in and you have the final say-so as to whether or not you want to participate in the study. ClinicalTrials.gov is a great place to start finding these trials, but MyLocalStudy.com and the Mayo Clinic can yield results as well. Good medical trials can pay hundreds, sometimes thousands of dollars, again, depending on your study. To learn more about how these studies work, refer to this National Institute on Aging guide for more information. If you feel you’re handy with a computer, offer your services to help upgrade memory, build out new PCs or even remove viruses. In some cases, you could even teach people how to use their computer software effectively. Most of these jobs are pretty simple, even with a quick Google search, and can net you about $30, $50 or even $100 depending on the complexity of the job. If you just want a job for the day, then there’s nothing better than your local Craigslist “Gigs” section. From moving furniture to helping with an event, browse the listings to see if there are any jobs of interest. For example, when I took a look while writing this, I saw ads for bartenders, a welder, product testers, babysitter and so much more. Just remember, Craigslist is still filled with a TON of scams, so if it sounds too good to be true, well, it probably is! Take a look and see what you can do today. Just as it sounds, there are a variety of awesome gigs out there in which you deliver food from local restaurants to nearby homes, all from your app. Work when you want, pick out the jobs you want to do and work without a boss breathing down your neck. Sign up with one (or all) of the apps mentioned below, get approved and you could be working in as little as a few days. Keep in mind that some of these platforms will only be available in some cities, and even if it is, you may find that some cities are much busier than others, meaning your income could be much different than someone else online. In the end, delivering food can be lucrative, sometimes up to $25 an hour during the dinner rush, but don’t forget to factor in your car expenses and taxes since you will be considered an independent contractor. As a great way to work whenever you want, this is one of my favorite job ideas if I personally had to choose one. Much like delivering food, groceries works in the same way, but instead, you’re either shopping and delivering, or one or the other. Popular companies in this space include Instacart, Shipt and even Amazon as they work with their parent company, Whole Foods. There are also some smaller grocery store chains that hire drivers as well. Like a lot of these gig economy jobs, these companies allow you to work whenever you choose and pick out whatever job you want to accept, all through the official app. From washing the outside to detailing the inside, most detailers charge at least $100 per job, especially if they have to drive to the job site. If you don’t mind being outdoors and polishing some cars up, the money is there. You just need to know how to promote yourself. For more information, check out the top-rated book, How to Start a Home-based Car Detailing Business (Home-Based Business Series) on Amazon, a book that teaches you everything you need to know to run a successful detailing business. Feel like you can dish out the tunes and be the life of the party? From birthday parties to weddings, DJs can make some great money, all while only having to commit to one or two gigs a week. The DJ world is competitive, but if you know how to hustle, the money is there. To learn more about the industry, check out How to Become a DJ for Hire: An Essential Guide to DJing for Beginners, a book that teaches you everything you need to know to become a respected DJ. If you know of anyone with a dog, there’s a good chance they may not have the time to take their pooch out for a walk. And yes, believe it or not, people do pay others to walk their dog, usually anywhere from $10 to $20+ per walk, and since this needs to happen daily. it could mean more money in your pocket every day. Even if you don’t know of anybody with a dog, that’s fine, too, as Care.com and even Wag.com can connect you with people who are looking for dog walkers in your area. If you love to drive, there are other ways to make money, aside from delivering food. Whether it’s driving some passengers or even packages, you may have heard of the options I am about to list below, but in all honesty, it’s one of the BEST ways to earn money on your own time. You get to work when you want and don’t have to worry about a boss breathing down your neck. Even though you probably heard of these options, here are the sign-up links. In most cases, following these links can often to some hefty sign-up bonuses once you commit to a certain number of rides. As long as you have a clean background check, qualifying vehicle, you’re 21+ years old, have a good driving history and a valid ID, there’s no reason you can’t be approved in as little as 48 hours. All with the exception of Amazon, Uber and Lyft almost hire on the spot once your background check clears. Aside from blogging, there are ways to write books, all without having to reach out to a massive publisher. From posting on Amazon or even Barnes and Noble, writing an eBook could take some time, but it could pay off dividends for quite some time once it’s posted. In most cases, publishing takes a few minutes once your book completes and it can appear on the virtual storefronts in as little as 48 hours. Personally, I have thought about writing an eBook, but now, I include everything I have learned on this blog for the time being. But, if you want to learn even more about the industry in general and how to succeed, check out these Udemy courses and top-rated Amazon books. Local farms are almost always in desperate need for extra help and some farmers are more than willing to work around your schedule. From cleaning horse stables to performing basic chores, the work can be grueling, but it’s yet another option if you want something that’s outdoorsy and doesn’t linger late into the night. To find some local farm work, start with Craigslist or even reach out on a local Facebook group if you know of farms being nearby. Fiverr is an awesome online platform in which you can sell virtually ANYTHING. From sending a message as Jesus to creating a graphic, if you’re creative and know you can promote yourself, it’s a wonderful way to make some side cash at your own pace. Now, you probably won’t make money overnight, but it’s important to know how to market yourself on this platform as well as what gigs sell to make some decent money. I haven’t dabbled much with Fiverr as a buyer, but I did read The Fiverr Master Class, an extremely cheap yet highly-rated book that teaches you all the secrets of $100,000 Fiverr power sellers. In the end, if you want to show off your skills, again, no matter what it may be, this highly popular platform may have the buyers you’re looking for. The buyers are defintely there. You just need to know how to reach them. Flipping is an awesome way to make some great money once you get good enough at it, and if you don’t know how it works, the concept is quite simple. Your goal is to find an item anywhere, whether it’s the local Goodwill, Target, flea market or even online, and attempt to find something of value that you know you can flip for a profit online in some sense. A lot of people, for instance, pick out books and find this to be quite profitable. So, for example, if I found a book selling for $1 at Goodwill and it sells for $8 on Amazon, I could flip it and make a few dollars. Do this 10 times over and it starts to add up. Now, it isn’t as easy as scouring the clearance shelf and picking out what looks good as there are apps out there that can help you figure what’s good and what’s not. I could babble on and on about this in a sense, but for now, I will recommend these awesome Udemy courses and the book I personally read, Thrift Store Knick Knacks Into Giant Cash Stacks. As for free advice, the flipping subreddit is an awesome source for everything flipping as well. RentAFriend.com is a website in which you can sign up and then get paid to hang out with people in your area. I know, it sounds a bit odd, but people actually make money with it. From going to the movies to attending an event, if you’re social and don’t mind mingling with strangers, it may be something to consider. Now, looking into it, RentAFriend.com IS NOT a dating website nor is it an illegal service to hook up for the night. It’s a simple website to make friends, that’s it. Friends start at $10 an hour, it appears, but this rate can be negotiated with someone who may want to hang out with you. This is kind of similar to the research companies I mentioned in the very beginning, but it’s a pinch different, since, most of the time, you have to meet in person. Similar to surveys, focus groups are usually done in groups, where you will discuss topics, test products or even test a product at home and report back to them later, sharing your thoughts. The jobs can be sporadic, but a lot of them do pay more than $100+ per visit, making it worth your time if you can make one. If you get a chance, do check out my $100 per survey guide, as I talk about 25+ companies that you may want to consider. I will talk about a few freelancing opportunities on this list, but there are so many more that you may want to consider, but it will greatly depend on the skills you have. You can even use this list for some ideas for Fiverr if you’re considering this route as well. If you don’t mind bidding on jobs and managing your own mini-empire, then freelancing can turn into quite the lucrative gig. And since there are so many freelancing options, I will just leave you with this graphic to explore to see if anything is of interest. Take a look, and if you’re thinking you can offer that service, then consider working Upwork or Fiverr, two of the largest freelancing job boards on the Internet right now. If you’re a fan of graphic design, there’s a market for everything, from creating a brochure to designing a website. And yes, while you will have a lot of overseas competition, don’t let it deter you as you can still make some decent money if you know what you’re doing and have a great portfolio that wows people. Each website works in a different way. For example, one website may require that you bid on projects, whereas a website like 99Designs.com works like a competition, where you can submit your work in hopes the creator accepts your work. Becoming a graphic designer could take some work to find clients, but once you prove yourself, you should see the word of mouth spread. This is probably a one and done since it’s going to take so long to grow your hair back, but if you can spare a few inches of your hair, then you may want to consider doing so. Websites, such as HairSellOn.com, have a calculator on their website letting you know exactly how much you can make. For example, if you sold six inches of three-inch thick hair, you could get about $91. Check out the website to see what you could potentially get! Feel as if you can fix small things around the house? From installing a faucet to fixing a hole in the wall, handyman requests can be endless if you market yourself properly. And like a lot of these entrepreneur options, it could take time to see your first customer, but once you prove yourself, you will find you may soon have too much work to handle. If it sounds like something you want to do, I did find a few highly-rated books on Amazon that may be of interest that teach you the ropes as to how to advertise yourself and get started with the process. Have a larger truck or don’t mind driving a U-Haul? You could help people in your area pick up larger items, such as furniture, or even haul items away to the dump. Since some people don’t have access to a truck or don’t want to waste their time, this is where you could come in and do the dirty work for them. Similar to that of babysitting children and pets, house sitting is probably the easiest on the babysitting list as all you need to do is make sure the house is in working order. From checking in daily, maybe picking up the newspaper out of the driveway to actually living in the home while the homeowners are away, there is a need since homeowners just want a peace of mind while away. I’ll mention the website a few times on this guide, but Care.com is a nice place to start if you want to start bidding on house sitting job and create a profile so that local homeowners can contact you. Yes, I know most internships don’t pay, but there are some internships that may pay you at least minimum wage, however. Regardless, if you’re lucky enough to land an internship that pays, it is not only great for the paycheck, but it will help you gain valuable experience for your future career. Consider it a great resume builder. To find an internship, check with your college’s career office, visit internships.com or search Indeed for internship opportunities. Do you have access to a washing machine and dryer? If so, you may have a business idea right here, wherein you can pick up other people’s laundry and bring it home to do it for them. Care.com is a great place to start bidding on jobs or even creating a profile, but you can also offer your services on Facebook, Craigslist and anywhere else you can think of to gain exposure. It sounds silly, but you’d be surprised at how many people would be willing to hire you! As a way to work outside and be near the water, the local pools and beaches, if you live near one, are always looking to hire lifeguards for the summer. Yes, you do need to be certified, most of which takes upwards of 30 hours to complete, but if you don’t mind learning, it’s a nice way to earn anywhere from $10 to $15+ an hour. Quite the competitive field, I know, but, if you live in the big city, there could be some jobs you could take advantage of. Now, as a fair warning, I know NOTHING about modeling, but I’m just including it here as I want to cover all grounds. I did find some highly rated books on Amazon, for instance, that teach you how you can land your dream audition and role if interested. Mystery shopping, as it sounds, requires you to shop undercover and basically grade the store, critique the employees you interact with and create a report once done. In most cases, you can not only get paid per shop, but the company will sometimes include a free meal, hotel stay, movie screening and much more. Almost all of your major corporations need this feedback and heavily depend on the mystery shopping market, so this is where you can come in, sometimes making up to $100+ per job. It can take some work to create a profile and get started, but once you get activated, it’s then up to you to accept the jobs you want to work. There’s a lot to learn, but to learn more in depth, I do recommend Cathy Stucker’s, The Mystery Shopper’s Manual. It’s a great read that covers the entire industry, helping you get a jump start. This one could be a fun way to earn $100 or so, but it’s not guaranteed. Working as a contest, websites, such as NamingForce and SquadHelp, will pay you if a business likes your business name idea. And as mentioned, there’s no guarantee you will get paid, but if you’re bored, browse a few listings and submit a creative name. You can’t win if you don’t play, right? A notary agent will be commissioned by the state and is needed to make sure documents, such as a real estate loan, is executed, notarized and returned for processing on time. In short, you’re going to let the party you’re working with know what they are signing, let them know where they need to sign as well as witness their signature by essentially stamping your notarizing stamp on the documents, along with your signature. Now, the great thing about becoming a notary agent is that you don’t need a college degree, but you need to be commissioned by your state. As for the requirements, it greatly depends on the state you reside in, but in some cases, all it takes on your part is a simple application form. Notary agents pay anywhere from $50 to $200+ an hour, and it’s truly a flexible job in which you can accept jobs as you please. While I would love to explain how you can start making money, I do recommend a few of these highly-rated books on Amazon that can explain the industry much more in-depth if interested. I’m a huge fan of Udemy and promote them on this blog for a myriad of reasons. For one, the courses are so cheap, often less than $20 and you can learn as much, if not more than the stupid $100+ courses you see so many bloggers promoting. Remember, the only reason these bloggers push these highly priced guides is that they make a HUGE profit, so as usual, a lot of them are thinking of their pocketbook, not yours. And secondly, the platform is VERY user-friendly, on both the seller and buyer end. With that out of the way, creating an online course, whether it’s on Udemy or promoted on your own via a website, could be quite lucrative if it’s informative enough. And yes, you can create a course on ANYTHING, but remember, there needs to be demand. To learn more about Udemy and creating your own courses in general, Udemy does have a variety of courses you can take. There are also a variety of books and resources online that you can check out as well if you’re interested in becoming an online teacher. Since most people have their home’s exterior painted during the warmer months, there’s probably a good chance you will have a few months off of college to work full-time and help paint. Whether it’s painting full-time or even painting interiors and exteriors throughout the year, painting either on a team or even on your own could be something to think about that earn you an average of $20+ an hour. Who doesn’t want to get fit? And if you love hitting the gym or being active in general, consider becoming a personal trainer. Yes, you will need to be certified to be taken seriously, but the whole process takes less than 10 weeks. If interested, check out the American Council on Exercise for more information on how to start. Pet sitting is a fantastic way to make $15 to $25+ per visit, doing what you may already do with your pet — feeding, cleaning up and walking a dog/s for about 15 minutes. Some pet owners may need you once or twice a day while they are at work whereas someone else may need you the entire week while they are on vacation. And much like my babysitting tip above, if you don’t know anyone who needs a pet sitter right now, that’s okay as there are some resources you can consider such as Rover.com, Care.com and PetSitter.com. All of these websites work in the same way, wherein you will create your own profile, describe what you can do and either wait for someone to contact you or you can bid on jobs yourself. If you know how to maintain a pool, you may be able to find a homeowner who needs your services weekly. And since most homeowners pay up to $100 per month, this could add up quite quickly if you sign up 10, 20 or even 30 homes. Mostly involving labor, yes, you will need chemicals here and there, but regardless, it could be an awesome job during the summer months or year-round for those who live in a warm climate. Believe it or not, but retail can actually be quite flexible for college students, but of course, it will depend on who you apply with. If you’re looking more toward a part-time job, consider searching for hourly jobs on SnagaJob.com or even narrow down your search on Indeed. Since retail often needs you on weekends and late at night, it could be a steady paycheck for the time being. If you love to take photos, did you know that you can turn around and sell these photos for a few dollars, if not more? With so many platforms online that allow you do so, I have talked about selling photos in depth on various guides, such as my 550+ ways to make money as well as this stay at home mom working guide and find it to be an awesome side job, especially for those who love photography in general. All of these websites work in the same way, in which you create an account and then post the pictures you want to sell. Do keep in mind, however, that some of these websites may consider your photos exclusive, which means you won’t be able to sell them elsewhere, so be sure you read the FAQ in detail before signing up. And for more information, I do recommend you check out a few of these awesome classes, particularly this low-cost course that teaches you how to make $5,000 per month selling your photos. It’s quite the read! I wrote about this simple idea in my 200+ ways to make money as a kid, but hey, I figured I would add it here as well. Millions of people own a pet, and most of them hate picking up their pet’s waste. This is where you can come in. While it may take a while to find a few clients, the work can pay off as you find they need you to keep coming back multiple times a week. From advertising your services on Craigslist or Facebook, I can promise you that people can use this service. It’s up to you to take action and start hustling. For guidance, I did see a few highly rated business plans on Amazon if you’re serious about this idea. If you have a garden or don’t mind setting one up, selling produce online or even at a local farmers market could be quite lucrative. And no, while you won’t be racking in the cash, it could be a great option for anybody who likes to be outdoors and mingle with the public. With a variety of options to sell fruits and vegetables, aside from the local farmers market, you could also consider the Facebook Marketplace, Craigslist or even sell on the side of the road if you have enough car traffic. Each semester, a professor usually hires one or two students to help grade papers, prepare lessons and even help with research. Referred to as a teaching assistant (TA), you will basically be the professor’s assistant for the semester. If you’re interested, particularly, in your field of study, be sure to talk with your professors to see if they need any help or even check our local college job boards for more information. Also included in my how kids can make money guide, recycling can actually earn you a few extra dollars in your spare time, especially if you live in a state with a bottle deposit. From collecting scrap metal to collecting cans at a local park, you’re not going to make much, but it could at least be enough to buy a dinner for the night. Local sports leagues are often in desperate needs of referees for their games, and if you have the sports knowledge, consider talking and/browsing some local leagues to see if any openings are available. Usually, you have to be available during the weekends for a few hours, but in the end, if you do consider, it’s a great way to make some money and have fun. Today, you can rent out just about anything, all of which I try to include in this guide. But one option, in particular, that I like a lot relies on your car, wherein you can rent it out when it’s not in use and make up to $75+ a day. Of course, this greatly depends on the car you own. And, you’re probably thinking, “I don’t want to rent out my car! Somebody will probably destroy it, just like I do with a rental car.” I get the frustration. With peer-to-peer rentals, however, your renters are not only confirmed, but they know they are renting from an individual rather than a stranger, simply meaning most people won’t have this mindset. And if that’s not enough for peace of mind, Turo offers a $1 million liability policy and allows you to list your car for FREE. To see how much you can make with your car, I encourage you to head to Turo, click on the “learn more” tab on the top and then click on the “carculator” for more information. Have a wardrobe filled with designer clothes collecting dust? If so, here’s yet another thing you rent out — your clothes. StyleLend.com, one of the largest platforms online, for instance, lets you rent out your clothes and make 80% of the basic rental fee. Create a closet, list the clothes you’re willing to rent out and wait for a renter. While this website, in particular, is picky as to what brands they accept, it could work for those who have a closet filled with designer brands. Don’t want to rent your clothes and simply want to get rid of them? Cleaning out your closet is a very easy way to make a few bucks, so it may be wise to dump your clothes while they are still in style. For a full list of places that want to buy your clothes, be sure to check out a post we wrote in the past, 22 apps that want to buy your clothes. Who says you need to have people in your house overnight to make some money? With popular websites, such as JustPark, people are looking for both parking spaces as well as garage space to store anything ranging from a car to storage boxes. If you have space and don’t mind renting out like a storage unit, it could be a decent way to make an easy $50+ a month. If you have the ability to rent out a room in your home, then this could be one of the easiest ways to make some money on this list as all it takes on your part is managing the reservation and keeping the room clean. In some cities, it’s pretty easy to make $40+ a night or even more in highly populated touristy cities. Now, I know, it may not be a great idea if you don’t like the idea of living with a stranger for a few days, but in a lot of cases, these people just need a place to sleep for the night and won’t need the room for long anyway. And if you’re interested, there are a few highly popular websites, which I’m sure you have heard of — Airbnb and HomeAway. Both websites are extremely easy to use and you could have your listing active in as little as a few hours. Aside from renting out your car and your home, you can even rent out any items laying around your home for a daily profit. From lawn mowers to your Xbox One, there are a variety of platforms you can sign up for today and start listing in as little as a few minutes. Take a look around these websites and see what’s renting today, and if you feel you have some items worth renting, then you may want to consider doing so. This isn’t a job per se, but it’s money. 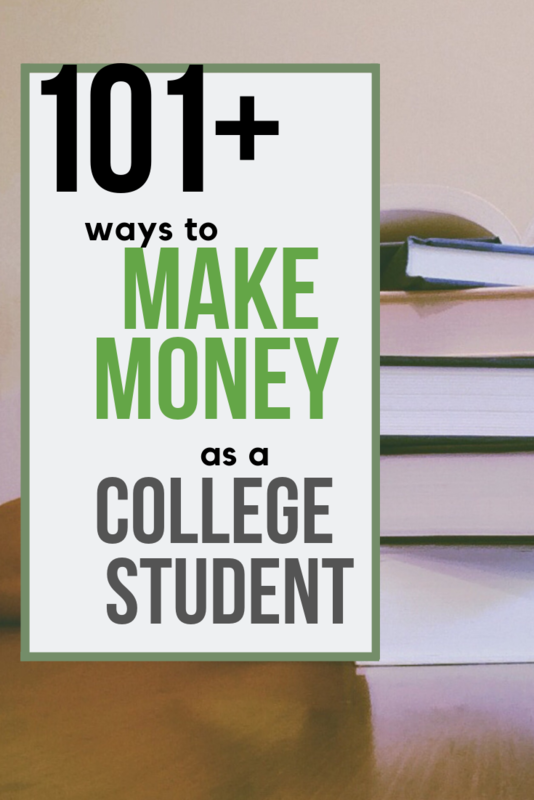 Since you’re in college, start scouring the web as there are THOUSANDS of scholarships you can apply for to earn hundreds, if not thousands towards your college tuition. Hey, it was money you didn’t have to earn, right? And with so many great scholarship resources online, I included some of my favorites below, but then again, there are many more with a quick search online. Read the details closely, apply and hopefully at least one comes through. Search engines are not perfect, and for that reason, search engine companies often hire third-party companies to help evaulate their search results and offer feedback. And if you want to help offer your feedback on the quality, usefulness and accuracy of the results, there are a few major companies almost always hiring, including Lionbridge and Appen Butler Hill. Do keep in mind, however, that this is similar to a part- or full-time job, wherein you do have to commit to a certain number of hours throughout the week. The good thing, though, is that you can work in the comfort of your own home. A bunch of jobs in one, senior citizens often need help with a variety of tasks, ranging from transportation to a doctor’s appointment or even helping around the house. Whether it’s becoming a caregiver or reaching out to the local community to see who needs help, there’s a market here. It’s just up to you to find who needs the help. Like to drive and want to do it on your own time? Well, I’m not sure if you’re familiar with the TV show, Storage Wars, wherein the participants bid on shipping jobs and deliver odd items from point A to point B. Whether it’s a 100-mile job or thousands of miles away, Uship.com is one of the largest platforms online where you connect with people who need items shipped right now. So, if you think you have the vehicle to complete the job and you meet the requirements, all of which you can read here, then, by all means, consider signing up and making a few hundred dollars shipping large items. During the winter months, you’d be amazed at how many households need their driveways shoveled. And while it won’t be guaranteed money since some winters are quite mild, it’s an idea to consider on a heavy snowfall day. Generally, a posting on a local Facebook group or even Craigslist could often yield some interest. I already mentioned donating your plasma above, but if you want to donate something else, sperm may be an option, especially if you don’t like the idea of needles. Short in supply, banks are looking for qualified candidates to help other families achieve their dream of having children. Most sperm banks will work in the same way, first wanting to analyze your sample, followed by letting you know if you’re approved or not. As most banks are strict, don’t be surprised if you’re not approved, but typically, as long as you’re 18 to 39 years old and in good health, you have a great chance at getting approved. Keep in mind that not everyone is approved and the analyzing portion is often unpaid, so it could be a waste of time if they don’t accept your sample. However, if they do, people report making anywhere from $50 to $100+ per sample, all depending on the location you choose. To find a sperm bank, a simple search, such as “sperm bank + zip code” can yield some decent results as well as more information as to how to apply. I only recommend this if you live in a busier city, such as Las Vegas, New York, etc. But, if you think you have a skill people may enjoy watching, whether it’s playing the guitar, dressing like a celebrity or even performing magic tricks, you could hit the streets and see who tips you. While it’s definitely a hustle, there are stories online stating that some people make up to $800 a day! The website, TaskRabbit, deserves its own subheading, simply based on the amount of work it can provide you. And if you’re unfamiliar with the app, let me explain how it works. With TaskRabbit, people in your area will submit a task, which can be just about anything, from hanging pictures to picking up a couch at a store, and will then post it on the job board. Then, as a Tasker, you can view these jobs in your area and select any that of interest at your own leisure. Once you confirm the details with the requester and you agree upon a price, you will complete the job, submit your invoice and get paid for the job. The website is 100% free to use as a “Tasker” and can be a great way to work when you want, set your own rates and only work the jobs that are of interest to you. If you’re in desperate need of money or you just need money temporarily, highly consider talking with a temp job agency. As the name implies, these agencies have connections with businesses that need help temporarily, and the great thing is that they can help both sides. For one, they will ask you what you can do in terms of skills as well as when you’re available, and based on this information, they may be able to help connect you with a local business. As the name implies, companies are always creating new apps, websites and products and are looking for the average consumer to test it for a variety of reasons. Usually taking about 10 to 30 minutes of your time, you can make up to $30+ per test, depending on the scope of the job and who you’re working with. Now, there are A LOT of companies you can work for, most of which I list below, but if you do decide to join, just be sure to read the FAQ before doing so as each website works in a different way. All of these websites work in the same way, wherein you will help test various products, commonly websites and apps. They are 100% free to join and should have enough work to make you a few dollars each month as long as you’re active on the platforms. You won’t get rich, but there’s no reason you can’t make $25+ a month. Good at a particular subject and don’t mind helping out other students? And no, it doesn’t have to be college students, either, as students, as young as five years old need help with a variety of topics, especially overseas in growing countries like China. Now, in the world of tutoring, you can help in person at a local library, for instance, or even tutor online if you want to work at your own pace. As always, read into the fine print to know what the restrictions are as well as what’s expected from you. Transcription, in a quick summary, involves listening to audio and typing what you hear in a word processing program like Microsoft Word. And with so many companies out there looking for work, many of them don’t even want you to have experience. Instead, they simply ask that you can type at least 60+ words per minute and have a good grasp of English grammar. If it sounds like something of interest, I did write about 101+ honest companies that are hiring right now. Know more than one language? Great, then you may want to consider becoming a translator online, translating a document in one language to the next. Working much like transcription, the only difference relies on the translating process, but this can work to your advantage since you could get paid more for your talents. Now, all of these companies will work in a different way. Some may require that you apply and commit to a certain number of hours to stay active, whereas other platforms let you log in and work as you please. Just be sure to research these companies in detail to know what’s expected of you if you do decide to apply. Touching upon the translating method, there’s yet another way to make money if you’re fluent in more than one language. italki.com, for instance, often hires teachers who are looking to earn extra money to teach others your language. Teachers with italki.com get to create their own schedule, work from home and even set their own prices. Today, more than five million students use the platform, with over 130 languages being taught. Much like graphic design, designing a T-shirt will essentially work in the same way; however, your goal is to design t-shirts and sell them on popular platforms for a profit. Now, the cool thing about selling t-shirts is that you don’t need to store boxes of inventory in your garage as most of these websites will print your graphic on a t-shirt and ship it off for you. Yes, while these websites charge a fee, you can still make a hefty profit, sometimes up to $5+ a t-shirt. Most of these websites work in the same way. Create a storefront, design your t-shirts, promote and wait for a sale. Of course, there’s much more to it than this, so for now, you may want to check out some of these highly rated books on Amazon for more information. Are you good with a particular video game, especially one that involves items, currency or accounts that require leveling up? Think games such as Rocket League, World of Warcraft, Fortnite and Leagues of Legends, to name a few. If you play any of these games, then yes, there are ways to make money, and no, it isn’t a scam. As long as there’s a demand for either an account, items or online currency in general, there’s a good chance you could make money, but keep in mind that the game must be in demand in order for you to see any orders. A popular website, such as PlayerAuctions.com, for example, allows you to create an account for free and then sell everything from gold to leveled accounts. I encourage you to check out the website to see what others are listing as well as what games are hot right now to see if the games you’re playing could turn into a profit. At PlayerAuctions.com, there are no membership fees, no listing fees and a 100% protection against buyer payment fraud. There are also other ways to make money with video games. You can learn more about this opportunity via a post I created in the past. As the name implies, a virtual assistant is just that — an assistant to somebody, but instead of working inside of an office, you’re going to do it all online. Quite the popular job online, I wouldn’t say this one of my favorite on the list due to foreign competition, but it could be an option if you’re a hustler and like the idea of odd and end-like jobs. If interested, take a gander at a post I wrote here in the past titled, How to Become a Virtual Assistant. It’s a free course that teaches you the basics as to what the job entails, the jobs you can perform and where you can apply. Do you think you have a great voice? If so, consider doing voice-over work, essentially reading scripts for advertisements or even videos. It’s not unheard of to find good voice-over artists making $100+ a day. Even if you don’t have much experience, there’s always time to learn. Amazon, for example, has a few books, showing you how to get started in the industry. Udemy also has a TON of awesome classes that teach you how to book your next job, too. I’m not sure if you’re good at hacking or have an interest, but some companies will actually pay you if you’re able to hack their system. For example, Google publically lists their rewards, offering tens of thousands of dollars to anyone who finds a security vulnerability, while Tesla pays up to $15,000 per bug. If this is of interest, consider joining BugCrowd.com as they work with a ton of corporations that want people to find vulnerabilities in their systems. I recommend freelance writing so much because it is a fantastic way to make some decent money online pretty fast. And no, you don’t need to be a grammar nazi nor do you need to have a way with words, because, in most cases, you just need to create a simplified 500-word article or a quick summary. I’ve been writing online for years, and trust me, I don’t feel I’m even remotely close to being an awesome writer, but I still made money in doing so. Now, if you want to make money writing online, there are a TON of resources to choose from and start working, all of which I will list below, but as a fair warning, you may have to work for pennies in the beginning to build your client base. With some of these platforms, you may have to apply for a job, just like you would any other job, while others post work, where you can accept the job and submit your work. It all varies. As you can see, there are quite a few options to choose from, so you may have to set aside some time to research them if you’re interested in writing online and get paid for doing so. I also highly recommend the book, How To Make A Living With Your Writing, a fantastic book that shares how Joanna Penn, the author of the book, makes six figures a year writing. Unless you live in a warmer climate, start posting flyers, offering yard work services to local homes and even businesses. To mowing lawns to offering a full package, there are a lot of people who would be willing to hire you for your services. And depending on the size of the yard, most jobs should start at $30+ and increase from there. To learn more about the business and how to succeed, I do recommend you check out some of these top sellers on Amazon. I know, everyone wants to become a YouTube star, but don’t let it stop from becoming one as there’s a spot for everyone. You just need to know what you’re doing. While you may not make millions, you need to first think about a niche with demand and then create something of VALUE. I’m no YouTube expert by no means, but with anything in life, chase the passion instead of the money to keep yourself motivated as you create content. As long as you’re passionate about something and it shows, it shouldn’t be too hard to gain a following, especially if you continue to add great content. Now, with YouTube, it is said YouTubers make anywhere from $1 to $5+ per 1,000 views and getting to a point where you make $100+ a month could take months, so don’t be discouraged if you’re not making anything by next week. All of these books are an awesome starting point and won’t cost you an arm and leg. While most of these ideas can make you some extra cash, do keep in mind that it could take some time before you even see your first dollar in some circumstances. For instance, if you wanted to house sit and babysit, you’re going to have to gain someone’s trust before they even hire you. The same can be said about walking someone’s dog. Regardless, making extra cash as a college student can be done, but it’s going to take some work on your part. Pick out a few you like, research them a pinch more and then take action to see what works for you. And hopefully, once you do, you can make enough to do what you want to do, all while studying at school. In the meantime, I always love to hear about opportunities, so if you do have any, feel free to talk about them in the comments below.